Marquavious Gra- ham never saw the vast shores of the Atlantic Ocean before in his life. For that matter, his fellow students Andrew Tarvin, Gary Santos, and Dylan Sierra never stuck their toes in a sandy beach anywhere while growing up. Strangely, it wasn’t until each of these youth was adjudicated and assigned to a Department of Juvenile Justice (DJJ) secure facility near landlocked Columbus, Georgia that they began to learn about underwater nature, explore exciting ocean habitats and personally witness the wonders of sea life. As part of DJJ’s ‘Rescue2Restore’ national support service education grant, these youth from the Muscogee Youth Development Center (YDC) recently visited the Georgia coast for an educational field trip to Jekyll Island. This exceptional Education Service Project was sponsored by State Farm and Youth Services America for exceptional DJJ youth. The special program theme was ‘coastal education’ but it was the student participants who chose to focus their project topic on saving Georgia’s endangered sea turtles. 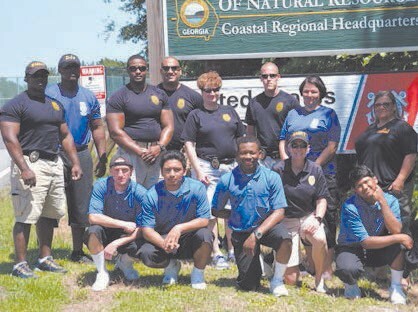 Escorted by juvenile corrections and program professionals, the Muscogee youth began their educational field trip with a visit to the busy Georgia Sea Turtle Center on Jekyll Island. Marquavious, Andrew, Gary, and Dylan witnessed firsthand the rehabilitation efforts presently underway to safeguard Georgia’s sea turtles and learned about similar worldwide efforts to preserve the health of sea turtle populations around the globe. “Learning about the sea and the environment opened up each of these youth to experiences greater than themselves,” said ‘Rescue2Restore’ Program Coordinator Chrissy Kaczynski. On an ecological guided beach tour the students were taught to recognize indigenous island plant and animal life. They were surprised to see turtle tracks from the previous night where determined female turtles laid their eggs on the beach. Then they discovered that a team of naturalists had found the tracks earlier and covered and marked the nesting sites for protection from animal and human predators. Following their Jekyll Island beach ecology and sea turtle rescue tour, the Muscogee youth met with biologists from the Department of Natural Resources (DNR) for a rare visit to a protected wild bird nesting area. The youth boarded small boats with a crew of biologists from the DNR Coastal Resource Division, including statewide sea turtle program coordinator Mark Dodd. While biologists were noting the numerous species of nesting birds, the DJJ youth also discovered that countless shells and an occasional find of shark teeth and fossils are also part of the coastal environment. Marquavious, Andrew, Gary, and Dylan learned about marine life injury and habitat damage caused by garbage and debris dumping in ocean environments, especially involving plastic waste. As an immediate public benefit from their studies, the Muscogee YDC youth began a recycling campaign at their DJJ secure facility back in landlocked Columbus. Now they’re trying to help raise public action and awareness for the threat to sea life, by designing reusable bags for sale to help raise ten-dollar donations to assist Georgia’s Sea Turtle Center. “The joy and amazement we have seen from our Muscogee students since visiting the Jekyll Island education center is contagious,” Program Coordinator Kaczynski said. The benefits of this field trip will last a lifetime.” Kaczynski said. DJJ Commissioner Avery D. Niles said, “We want our young people to experience this kind of personal discovery and inspiration. The ability to participate spurs creativity and increases willingness to work and add interactive value to the classroom experience. We will continue to ensure that educational field trips are part of the teachers’ toolbox and we’ll focus on changing the lives of our youth through quality education at DJJ,” said Commissioner Niles. The Department of Juvenile Justice is grateful to the Georgia Department of Natural Resources and the Georgia Sea Turtle Center for their extraordinary support of DJJ’s educational trip. To learn more about the Department of Natural Resources Coastal Resource Division office, visit them at coastalgadnr.org/. To view the Georgia Turtle Center, go to gstc. jekyllisland.com. Details about DJJ’s Rescue 2 Restore program can be found at www.djjnewsandviews.org/rescue2restore/.